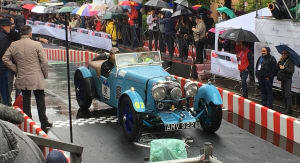 Not even a torrential downpour was enough to dull our enthusiasm as we made our way towards Brescia, for the start of one of the world’s most celebrated historic road races, Italy’s Mille Miglia. 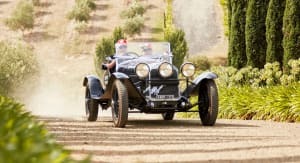 It’s an International automotive extravaganza dating back to 1927, when the first 1000-mile loop kicked off from Brescia in Italy’s north, down to Rome via Rimini, and back up to Brescia via Parma. 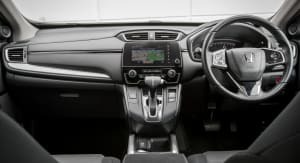 No coincidence, either, that in the early twenties, Brescia was home to no less than six automotive manufacturers including Officine Meccaniche, which started producing cars in 1918. It goes to show just how connected and impassioned people were (and still are) in these parts, at least when it came to building motor cars and racing them. The architects of the original race were a young Count Aymo Maggi and Franco Mazzotti, apparently in response to the Italian Grand Prix being moved from their home town of Brescia to Monza, where it has remained ever since. 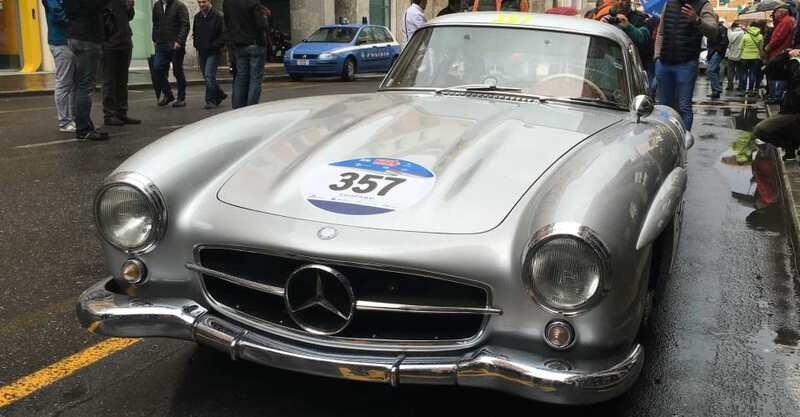 That first race attracted a total of 77 starters – all Italian and all strictly unmodified production cars, of which 51 crossed the finish line in Brescia after covering a distance of 1618 kilometres. 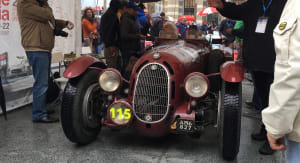 The winner of that eventful race was Giuseppe Morandi, who completed the course in just under 21 hours 5 minutes, at an average speed of 78km/h in his 2.0-litre Officine Meccaniche 665 S, from Brescia. 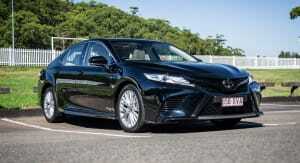 In fact, O.M. cars took the first three places. 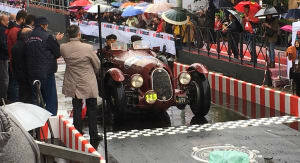 Alfa Romeo was on the podium too, winning the next three consecutive races including the 1930 Mille Miglia, when Tazio Nuvolari drove the straight-six-powered 6C 1500 to victory after trailing rival, Achille Varzi, almost the entire race, only passing him on the final straight section of road towards the finish line. 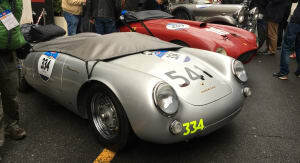 Italian cars and drivers continued to dominate the race for years to come, until the race was officially banned by the local government in 1957 after two horrific accidents. 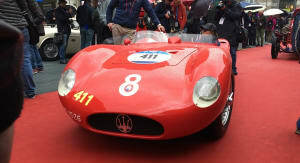 The first involved the 4.2-litre Ferrari 335 S that killed Spanish driver Alfonso de Portago, his co-driver Edmund Nelson, as well as nine spectators, including children. 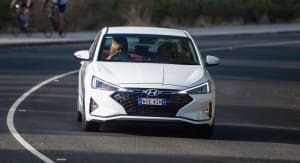 The accident happened close to the finish line in the village of Guidizzolo, where the car was estimated to have been travelling at huge speed (over 290 km/h) before a rear tyre burst, causing the catastrophe. 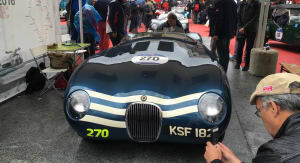 But ever since 1977, this grand event has been run as the Mille Miglia Storica, more like a rally than the flat-out race as it once was, but no less exciting for the hordes of enthusiasts arriving in Brescia from all over the globe to witness a collection of up to 460 magnificently restored cars (all in working order) built between 1927 and 1957. 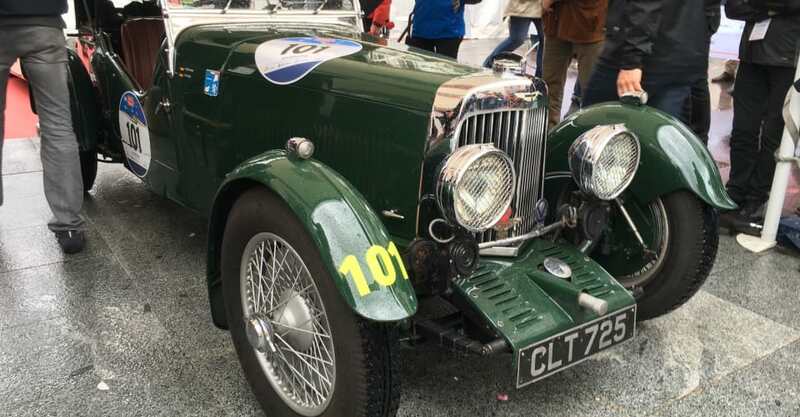 This year’s event also marked the 34th re-enactment of the Mille Miglia, which included all the great marques of today and yesteryear, such as Alfa Romeo, Aston Martin, Bentley, BMW, Bristol, Cisitalia, Bugatti, Citroen, Chrysler, Delage, Delahaye, Ferrari, Fiat, Fraser-Nash, Ford, Healy, Jaguar, Lancia, Lotus, Maserati, Mercedes-Benz, MG, Peugeot, Rover, Triumph and Zagato – a collection of over 460 magnificently restored classic cars. Apart from eleven-or-so examples of the O.M. 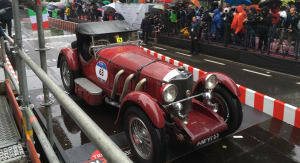 665 Superba, Alfa Romeo was also well represented at this year’s Mille Miglia with more than a few pristine 6Cs lining up on the start line. 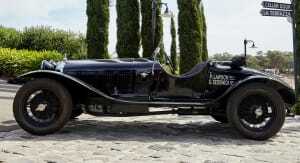 None more special though, than a 1929 6C SS, driven by Australians Paul Lawson and Graeme Sedgwick. This was a true barn find; discovered on a property in Calabria, Italy, in 1979 by Paul’s father. The original chassis and and engine were found buried under 10 tons of rusted farm equipment, where they had remained undisturbed for 40 years. 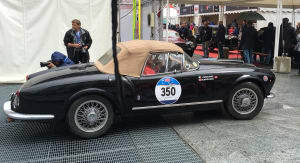 In fact, there were actually two cars, so he bought both and used the other for spares, as he lovingly restored the Alfa back to its original condition over a 30-year period. 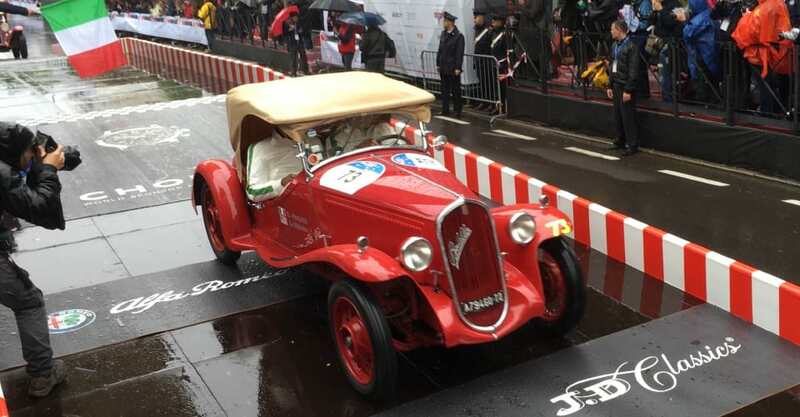 It’s the same model Alfa Romeo model that won the 1929 Mille Miglia – a race once described by Enzo Ferrari as “the most beautiful race in the world” due to the multitude of spectacular backdrops along the course. 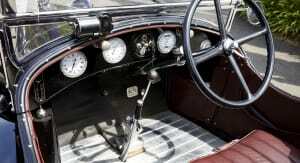 The Alfa 6C was the world’s fastest car at the time, capable of speeds in excess of 160-170km/h. 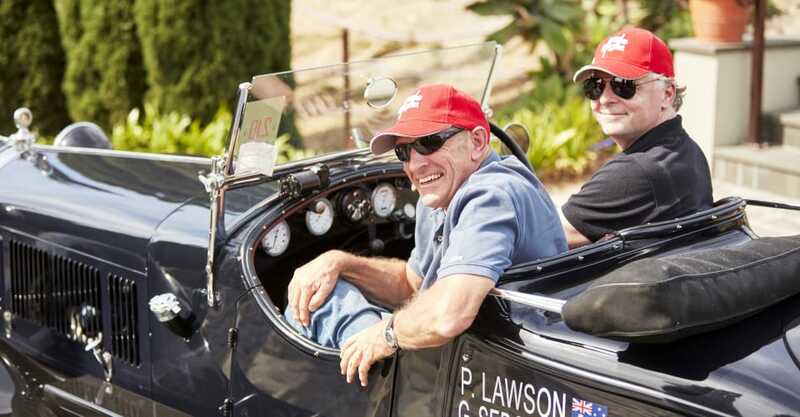 The Lawson’s 6C is now worth in excess of $2 million, but according to Paul, the car is not for sale at any price. “My father loves to drive the car, so it’s never been about the money, and I can’t see that changing”. 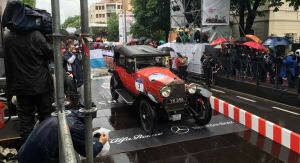 Several hours later it was still bucketing down, but to be finally be on the ground in Brescia for the start of this most celebrated event, and all the fanfare that goes with it, is somewhat surreal and truly the stuff of bucket lists for motoring enthusiasts. It’s a magnificently colorful program that not only brings out such a bounty of rare and wonderful cars, but also draws some wonderfully eccentric characters like the English chap – at least that’s what I assumed – whom we came across in full period dress, complete with pith helmet and waxed mustache, looking like he’d jumped straight off the set of the 60s movie, Chitty Chitty Bang Bang. 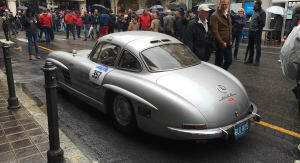 One of the many standout entrants was a Mercedes-Benz 300 SL Coupe W 194 in absolute mint condition, driven by Ray Langston and Kate Hayes of the United States. Unfortunately, Lawson’s 6C never made it to the starting line. 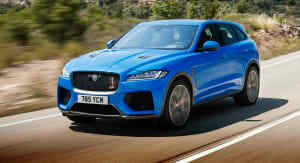 Although the car arrived in Italy in pristine condition, it suffered a catastrophic condition after a shake down around Lake Garda. “The next morning I went to start the car – and bang, the cylinder cracked, which meant we were out of the Mille Miglia, after years of planning – at least with our 6C. Alfa Romeo very kindly provided Graeme and I with the opportunity of driving a new 4C, which we thoroughly enjoyed, given its phenomenal performance on these roads”. 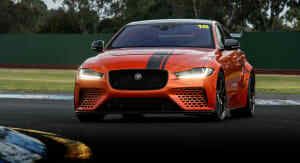 Of course, the car was repaired in Italy, just down the road from Brescia, in readiness for its return next year, which Paul assures us he’ll be back for.